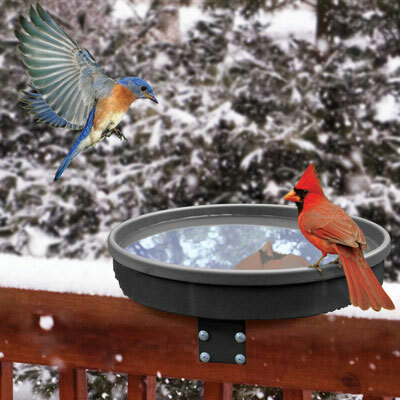 Provide your songbirds with fresh water year-round with this versatile heated birdbath. Intelligently designed with a shallow water level that's safe for birds, it has three mounting options: deck mount, clamp mount and ground use. A built-in 75-watt heater keeps water from freezing down to -10 degrees F (-23 degrees C). Because it's thermostatically controlled, it costs just pennies to operate. The power cord tucks away for year-round use. 14.75" diameter and 2.3" tall. Weighs 3 lb.